The author is an attorney, author, and professor at the George Washington University. He is author of the legal treatise Hate Crimes Law (Westlaw), periodically revises the First Amendment chapter in Sexual Orientation and the Law (Westlaw), and authors briefs to the U.S. Supreme Court on behalf of various human and civil rights organizations. By a 5-4 vote, and over a powerful dissent by Justice Ginsberg, the U.S. Supreme Court on June 25 struck down a key provision of the Voting Rights Act that had been protecting voters from discrimination since its enactment in 1965. Section four of the VRA enacts a formula to identify states that have a history of race discrimination in their voting laws. Then, section five requires that those states get “pre-clearance”—approval from either the Department of Justice or a federal court—before making any changes to their election laws, such as eliminating early voting, changing registration or ID requirements, or redrawing congressional districts. The majority of the court agreed that pre-clearance is at least potentially appropriate in some circumstances. But it also ruled that the formula for deciding which states should be subject to pre-clearance is outdated and therefore unconstitutional. In fact, Congress held extensive fact-finding hearings before it reauthorized the VRA in 2006. In the years since the prior reauthorization in 1982, the pre-clearance process worked to block more than 700 discriminatory changes, with another 800 proposed changes being withdrawn or altered in response to concerns in the initial stages of pre-clearance. Several extremely significant discriminatory changes were proposed in the few years leading up to the 2006 VRA reauthorization. Moreover, although the progress in the elimination of race discrimination in elections was significant, Congress realized that discrimination was now taking form in subtler ways (“second-generation obstacles”), which would be harder to block without a pre-clearance mechanism. Based on that evidence, Congress concluded that pre-clearance had been a necessary tool in recent years in order to prevent voting law changes that would have undermined equal voting rights, and that we needed pre-clearance still in order to prevent regression and build upon the gains that have been made. The majority points to improved voter registration and turnout rates among African Americans and other traditionally underrepresented groups, and assumes those statistics show that the VRA is no longer necessary. Voting rights advocates, on the other hand, see evidence in these same statistics that we still need the law, and argue that the record of active use of pre-clearance procedures to prevent discriminatory changes in election laws is the reason there has been progress in registration and turnout. 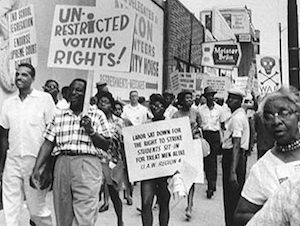 Eliminating VRA pre-clearance because minority voting is less oppressed than it used to be is akin to eliminating Clean Water Act regulations because drinking water is cleaner than it used to be. Even as the majority insists that voting rights advocates have an outdated view of the country, it clings to a view of “state’s rights” that predates the Civil War. The majority opinion begins with assertions of state sovereignty and autonomy over elections, and says the “Voting Rights Act sharply departs from these basic principles.” However, as Justice Ginsberg notes, those constitutional principles were altered dramatically by the Reconstruction Amendments enacted after the Civil War, which sought to prevent “states’ rights” from being used to oppress African Americans and, specifically, suppress the vote, and it put Congress in charge of securing individual rights by enacting “appropriate legislation.” The reasoning in today’s majority opinion that reflects internalization of a view of states’ rights unmodified by the Civil War and the great struggles for equality throughout our history and today—and in the context of voting rights, no less—is as disturbing as the outcome itself.